I’ve been out hiking every day for the last month. Well, maybe not every day but I never take more than one day off each week. I now am averaging 30 miles hiked per week. My goal is to gradually work that amount upward as the Camino Portugues nears. 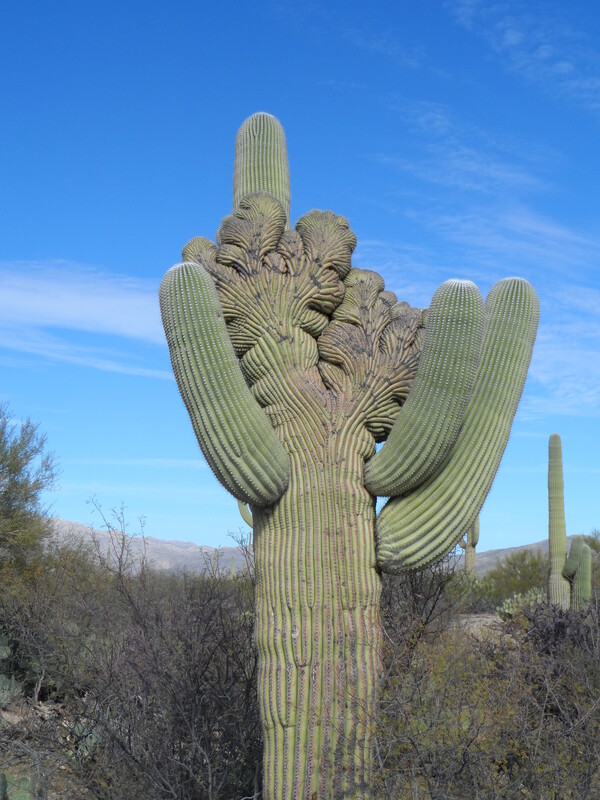 On Sunday, I hiked 9.7 miles in the Saguaro National Monument. I hiked the Cactus Forest Trail from the Broadway Trailhead to about 1/8 mile from the Old Spanish Trail Trailhead and back. The reason I didn’t make it to Old Spanish Trail was because the trail was a very steep downhill and was all washed out which would have required rock scrambling. Since I was alone and feeling a bit tired, I opted to be safe rather than sorry. 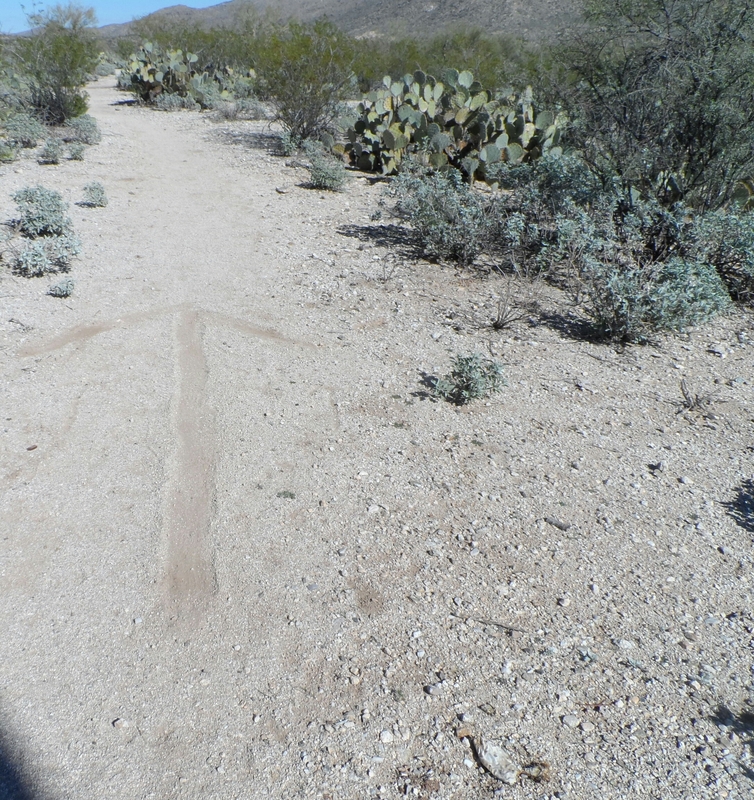 I did come across this arrow scratched into the trail. I see signs of the Camino everywhere I look. Sunday was an absolutely perfect day for hiking, my collection of Road Songs and More Road Songs played on the mp3 player as I walked. 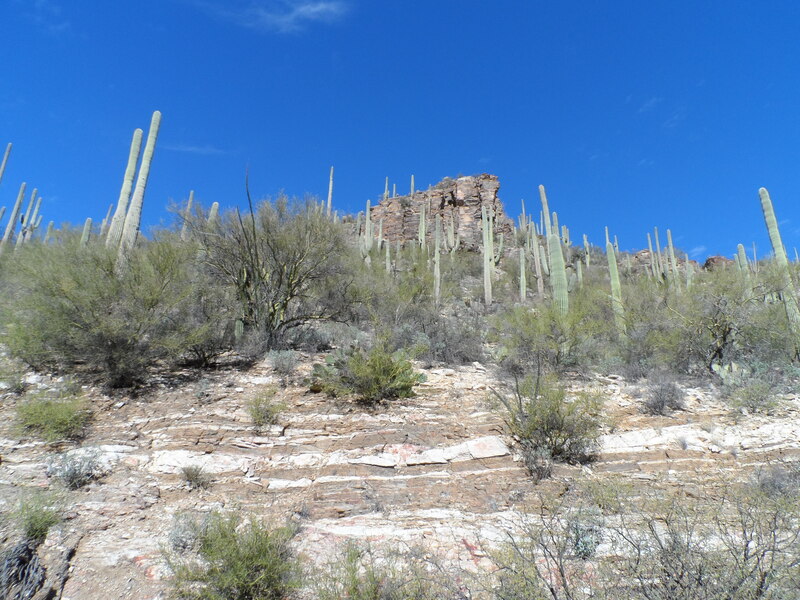 The sun was shining but it wasn’t hot; a perfect Tucson, Arizona day to hike. I returned home a very happy gal! 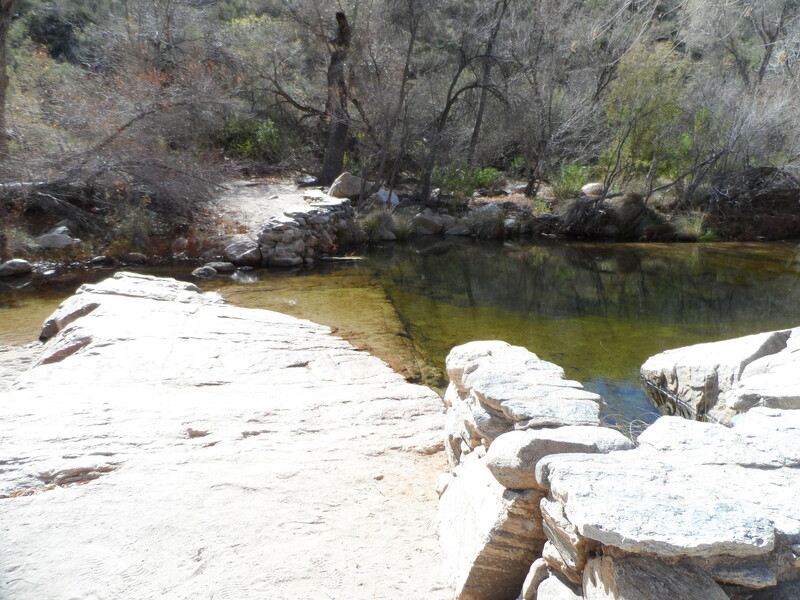 On Monday, I headed to Sabino Canyon with Jocelyn, who is visiting for her usual Winter Mountain Bike Training Camp. Monday was a day for her to be off her bike since she raced Single Speed Arizona on Saturday, so we hiked the tram roadway instead. 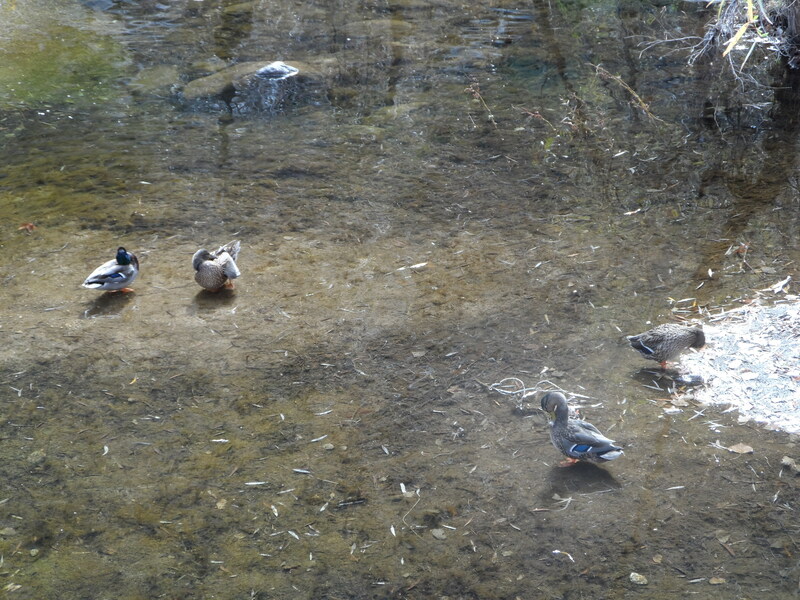 I clocked in another 8.2 miles – a great hike to start this week’s mileage tally. 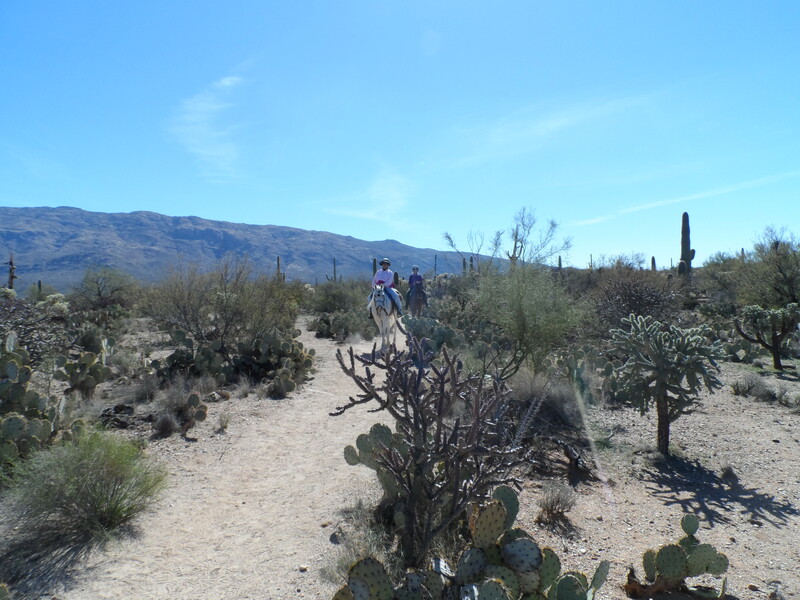 We followed the hike with an iced Red-Eye coffee from a new Coffee shop near Sabino Canyon called Brewd. 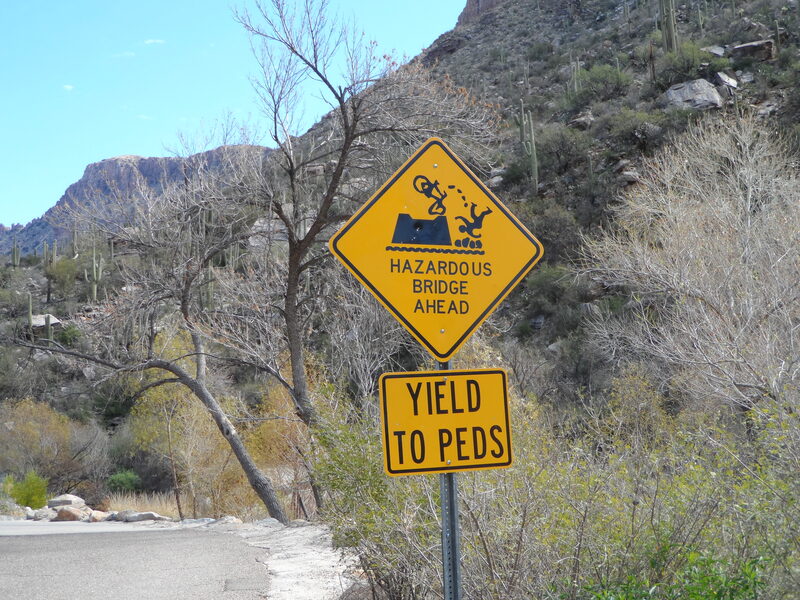 This entry was posted in Adventures, Camino Portugués 2014 and tagged camino de santiago, London, mountain bike racers, Sabino Canyon, Saguaro National Park. Bookmark the permalink. Go girl, good for you! I wish I was in hiking mode now too.. 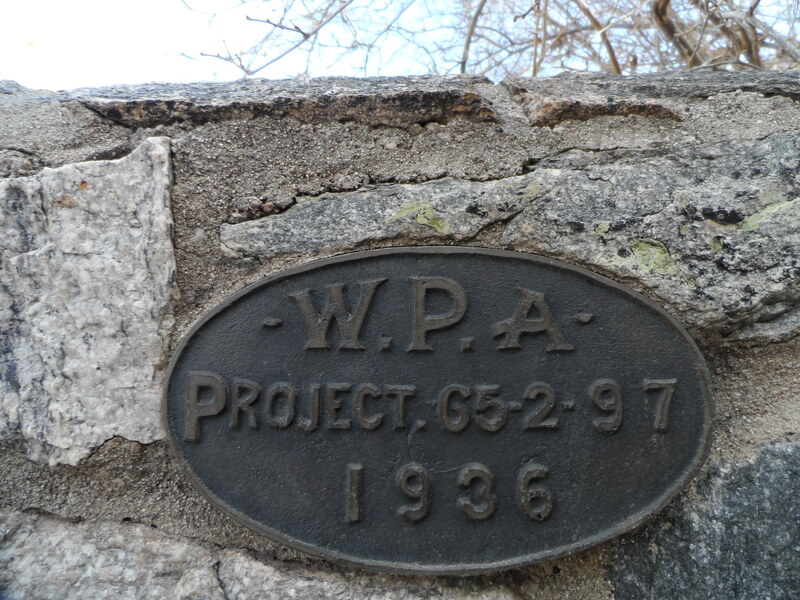 I have no choice but to hike – I leave for the Portugues Camino on April 4th. The after I return I must continue hiking so I remain in shape for another Camino during the summer. Great going, Arlene. Texas could use some of those perfect Tucson days. The weather this year is crazy. February is colder than it was in January and so far it has rained twice. We had not a drop of rain during January which is our usual rainy month. Go figure! Dear Arlene, not that I’m in training for a walk (drats!) or anything, but I think if I lived in as stunning place as you, I’d feel compelled to get out there too. The last few weeks instead of going to the gym, I’ve walked along Manly Beach (you should come visit some time!!) and finishing off with a swim in the ocean pool (ie shark proof!) at the end of the beach. So I guess I should’nt complain about the environment that I inhabit. Keep up the good work – I really enjoy reading about your world. Nice to hear from you even if it is one party removed. Be glad when Bill rejuvenates the Camino blog as it really kept us all together. I am really looking forward to the Portuguese Camino with Bill, Jen, and Arlene. She has the good weather in Tucson. It has been unseasonably cold and wet here in Texas. Brrrr!! I’m in agreement with you, can’t wait for Bill to regenerate the Camino blog. That blog seemed to have a lot more bantering back and forth than does his food blog. Oh well, won’t be long now. Was wondering why Bill did not plan the full Portuguese Camino. Did not realize it started at Lisbon until I saw it on your map. Would have been fun to have done it all, and that from a guy who does not like to walk. Perhaps some of us could have planned to start at Lisbon and then met the tour in Porto, but, alas, too late now after tickets are bought. Mine are. How about yours? I guess before long Duncan will be asking for the final payment. Yeah Steve, I have my tickets also. I’ll be arriving in Porto a few days early to sleep off the jet lag and hopefully meet with Bill and Jen and the others who will also be there early. It sure would have been nice to start from Lisbon, but like you said too late now. BTW, I’m creating a listing of albergues and hotels/casas on the Portuguese Camino. I have one already for the Frances that I worked on with a friend. That one is posted on Ivar’s forum. And now APOC has just posted it on their website. I will be giving the Portuguese one to APOC as well as Ivar’s forum. If you would like the link for your next Texas Chapter meeting, let me know. Hi Britta, great to hear from you. Australia is a place I truly would like to visit some day. I’m curious about the wildlife and now I’m curious about the ocean pools. Funny, I don’t think of the desert as stunning, it’s dry, dry, dry and dusty and when summer comes it is God Awful Hot!!! But it is where I am for the present moment and I make the best of it. At the very least, I can hike year round.